Our menu clears all the bases with a wide range of freshly made selections for you to enjoy! Warm up with one of our scrumptious starters to curb your cravings! We start with butter and garlic, then pile on shredded mozzarella cheese. Served warm with marinara sauce. Your choice of Original, Hot, Teriyaki, BBQ, Hot Honey BBQ, Thai, Teriyaki, Mango Habanero or Garlic Parmesan. 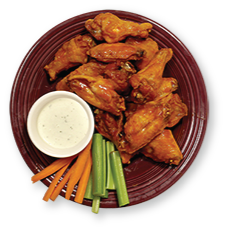 Served with your choice of bleu cheese or ranch. Your choice of Original, Hot, Teriyaki, BBQ, Hot Honey BBQ, Thai, Teriyaki, Mango Habanero or Garlic Parmesan. Served with your choice of bleu cheese or ranch. 9 ounces. A mound of fries smothered with melted cheese and bacon crumbles. 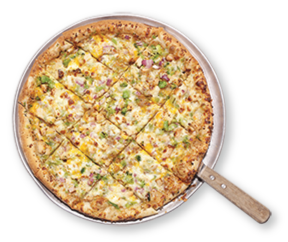 Our signature pizza, covered with buffalo style chicken, a tasty ranch sauce and mozzarella cheese. Loaded with beef, pepperoni, bacon, sausage and ham. 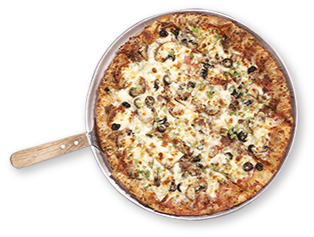 Sausage, beef, pepperoni, onions, mushrooms and black olives. Our thick, deep-dish pies may take a few extra minutes, but they’re worth it! Beef, bacon, onions, pickles, mozzarella and American cheese. Lots of black olives, green peppers, mushrooms, onions, and tomatoes. 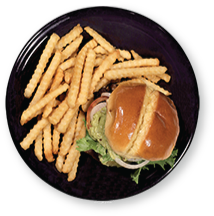 Throw your hunger a curveball—try one of our mouthwatering sandwiches or burgers! A juicy, third-pound grilled beef patty made fresh to order. Grilled chicken breast topped with Canadian bacon and Swiss cheese. tomato, onion and pickle on the side with potato chips. *Double any burger for $2.50 extra. Add jalapeno bacon $1.25. You’ll need two hands to tackle our tasty subs! Salami, ham, mozzarella, hot peppers, lettuce and tomato. peppers and onions, topped with mozzarella cheese. 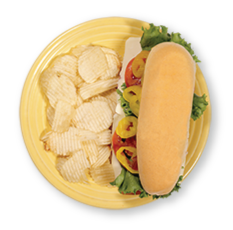 All subs are served warm and toasted (unless otherwise requested) with chips. Yummy goodness wrapped into one delicious package! and sour cream in a spinach wrap. Served with a side of Southwestern ranch. smothered in guacamole sauce with lettuce, tomato, and red onion. 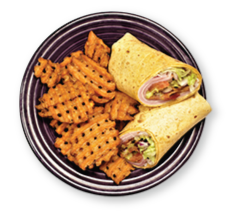 All wraps are served with potato chips. 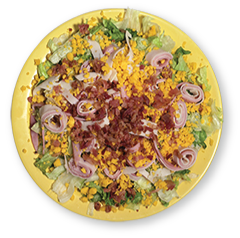 Our hearty salads are heavy hitters for any appetite! served with southwestern ranch, salsa and sour cream. Grilled chicken breast over lettuce, cheese, banana peppers, and tomatoes . Lettuce, hardboiled egg, turkey, ham, bacon, and cheddar cheese.